The Simpsons: Bartman Meets Radioactive Man is the third and final video game released for the NES by Acclaim Entertainment. The side-scrolling game is based on the The Simpsons animated series and features Bart Simpson on a comic book quest to save his favorite superhero, Radioactive Man, from destruction. The game is a sequel to The Simpsons: Bart vs. the World. 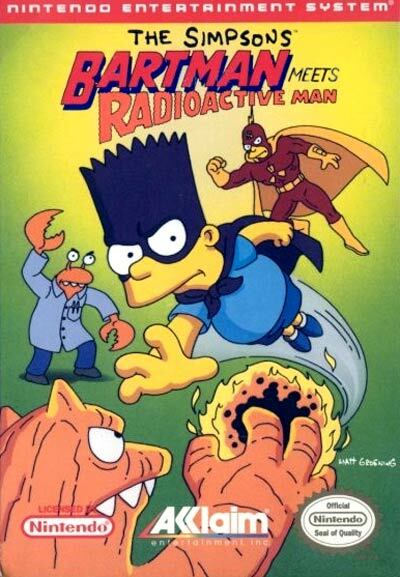 In the single player, side-scrolling game, Bart Simpson is at home reading a Radioactive Man comic book only to the shocked as Radioactive Man's sidekick, Fallout Boy, jumps out of the comic book and tells Bart that he must venture into the comic book universe in order to save Radioactive Man. Once inside the comic book world, Bart becomes Bartman and is able to collect various icons in the game that give Bartman a limited supply of laser beams that Bart can shoot out of his eyes. Like the two previous The Simpsons video games, Bartman was considered a difficult game to beat as there were no continues, password feature and Bartman was a superhero with few superpowers and no super strength.